Kevin M. Danforth, 50, died November 13, 2018. Kevin was born August 1, 1968 and was a lifelong resident of Pensacola. 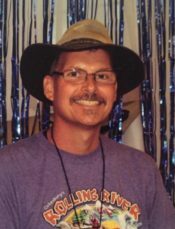 He was a faithful member of Aldersgate United Methodist Church in Molino, and was a dedicated scout leader for both Cub Scout Pack 430 and Boy Scout Troop 430 in Molino. He was a skilled craftsman in the construction industry for over 30 years. Kevin was a friend to everyone, and loved all the communities he was involved in; from church, to 4WD trucks, to Volkswagens, to scouts. He was passionate about serving the Lord in His church and the community. He was a gifted builder and fixer, mentor, leader, confidant, jokester, dad, husband, brother. He led his life with integrity, honor, humility, grace and compassion. Everything he did was done with excellence and care. Kevin was preceded in death by his Grandfather Edward “Pop” Cowan, Grandmother Laura “Gram” Cowan, his parents Dale Danforth and Jeanne Danforth, his Aunts Joyce Cowan and Carol Cowan. Survivors include his wife of 27 years, Dawn Danforth; children Emily (Dillon) Pollard, Nathan and Melanie Danforth; brother Dan (Amy) Danforth, sister Julianne (Dwayne) Tatum, brothers Steve Danforth, David Hespelt, and Ahshuwah Hawthorne; nieces and nephews Todd, Jordan, Daniel, Elizabeth, Samuel, Christian, Chase, Jacob, Mary-Grace, and Bentleigh; aunts, uncles, and cousins. Visitation will take place at Pensacola Memorial Gardens from 4:00 – 6:00 pm Sunday, November 18. Funeral will be Monday, November 19 at 11:00 am, also at Pensacola Memorial Gardens. Kevin was well cared for at The Woodlands, and had a deep appreciation for his doctors and nurses in Oncology and the infusion center. Donations in Kevin’s memory can be made to Boy Scout Troop 430, c/o Aldersgate United Methodist Church, 6915 Hwy 29 North, Molino FL, 32577. Kevin was a awesome friend that I had ths good fortune of meeting through scouting. He was true to his word and kept a greater vision in serving our Lord with the youth around him. He will be missed in life but his example of leadership will live on for generations to come through his family and scouts.